"The Internationale" (French: L'Internationale, French pronunciation: ​[lɛ̃.'tɛʀ.nas.jɔ. 'nal(ə)]; Russian: С Интернационалом, S Internatsionalom, Chinese: 國際歌, Guójìgē) is a very well known communist, socialist, and social democratic/democratic socialist song. While it was originally written in French, it was translated into many other languages, including English. The most famous versions, however, are those in Russian and Chinese. L'Internationale in original French version. 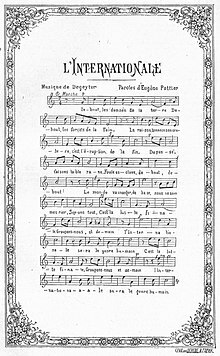 The French words, written by Eugene Pottier, were originally supposed to be sung to the tune of "La Marseillaise", but a separate tune was created for it by a Belgian named Pierre Degeyter. The Russian version, written by Arkady Yakolevich Kots (Аркадий Яковлевич Коц) in 1902, was adopted as the national anthem of the Russian Soviet Federative Socialist Republic (Russian SFSR) in 1918 and as that of the Union of Soviet Socialist Republics (the Soviet Union) in 1922. It stayed like this until 1944, when it was replaced by the State Anthem of the Soviet Union written by Alexander Alexandrov. The Chinese lyrics were written by Qu Qiubai (瞿秋白). The song is known by its tune, and its chorus, which in French begins with "C'est la lutte finale" (meaning "It's the final battle"). We were nothing, let's become everything! Equality needs protection by law! The kings of the mines and rails. What we created is melted together! The people want nothing but their due. Guns in the air, break their ranks! The great party of workers. The earth belongs only to humans! The idle will live elsewhere! I v smyertnyy boy vyesti gotov. Kto byl nichyem, tot stanet vsyem! Ready to lead a fight to death. we shall build a new world. Those that were nothing shall become everything! Nobody will send us deliverance. Neither God, nor Tsar, nor a hero. while the iron is hot! To glow with the fire of its rays. Wikimedia Commons has media related to The Internationale.